Now, who doesn’t love a great t-shirt dress? 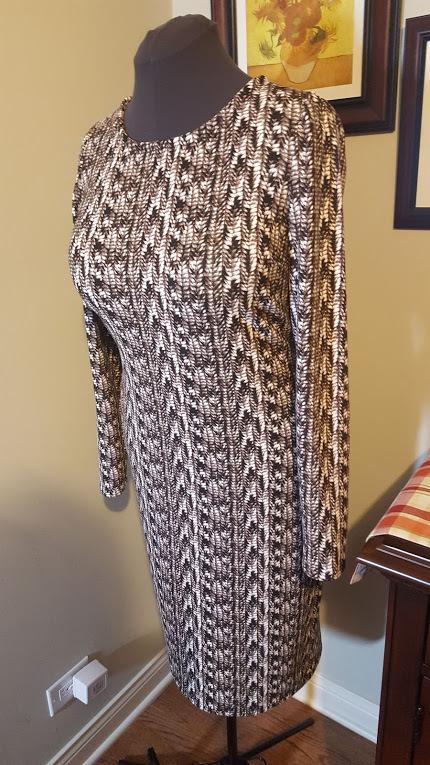 My latest dress made is my TNT V1314 t-shirt dress in Mood’s Taupe Sweater Knit Printed Rayon Jersey. Believe me, this one fabric you don’t want to pass up! It is a super soft beefy knit. It really doesn’t look like sweater knit, but it’s much thicker than your average rayon jersey. The drape is fluid, and it lays gently against the skin. It is great! Guess what? This will not be the last time you see this pattern made up in some amazing fabric. It’s quick and very easy. From cutting table to hem, it’s takes me about 2.5 hours to crank one of these babies out. Perfect go to pattern when you need a simple, cute dress that is also great staple that you can dress up or down. I like wearing this version with shoes that pop and a great statement shoulder bag. With that being said, I’m off to a great start with my Fall wardrobe. Quick, easy, and ready for the crisp, cool breeze of the fall season. That’s all for now!